I got to do something today that I haven't done in a VERY long time. I took a class at my local bead store. Inside the store is wall-to-wall goodies. And that's only a peek! 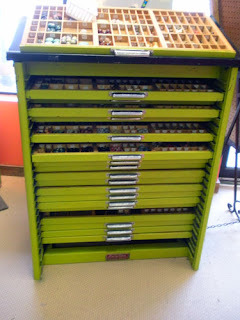 They've got at least four of these old printer's cabinets (that I think are as cool as all get-out) that are used for storing the bulk of their beads and findings. But of course the walls are also covered in sparklies as well! 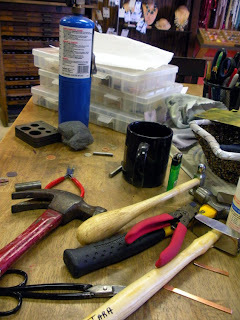 I decided to take the "Texture, Patina, and Polish" class to get more comfortable working with heavy tools and metal. I ended up being the only one enrolled. 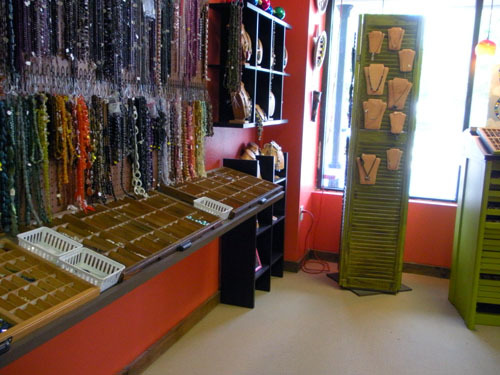 As such, I got plenty of one-on-one attention from Tara, the shop's owner. (Tara is a DELIGHT as is her husband, Jack, who is also often in the shop.) 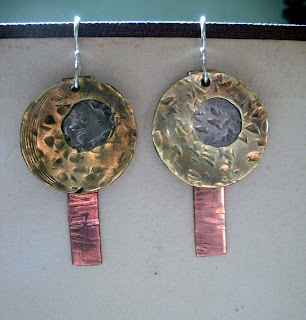 The goal of the class today was to make a pair of earrings. Tara had me draw out my design, cut out the metal shapes, file the metal, texture it, patina it, and punch holes. 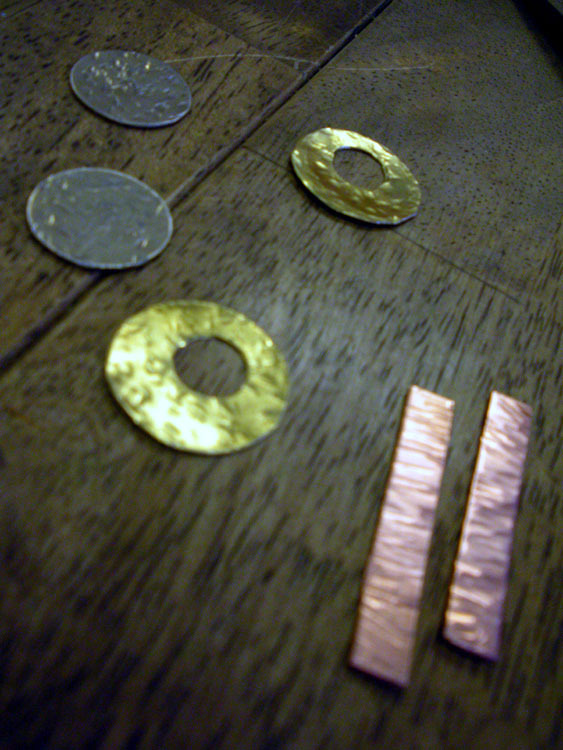 She even showed me how to make my own ear wires from which to hang the earrings. It was a BLAST. I know these are not 'perfect', but heck it was my first try and I'm quite happy with them! There's a calendar on their website with plenty of different classes. As well, Tara often takes classes herself in order to share her skills in the shop. 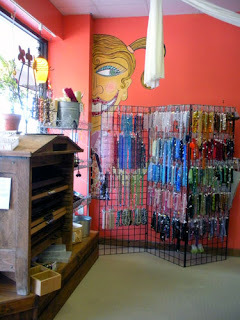 As well, she makes some of the coolest jewelry pieces that she sells there in the shop and at various shows. 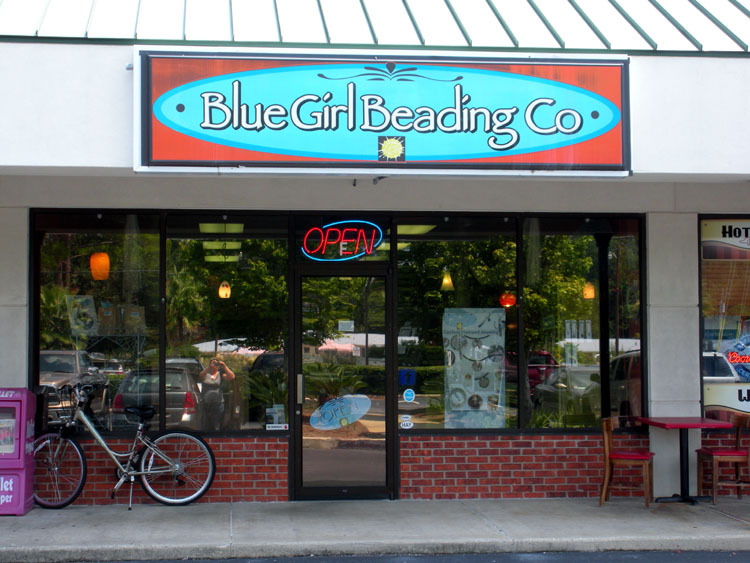 If you are ever in the Gulf Shores, Orange Beach, Fairhope. . .or just basically in South Alabama/Northwest Florida, you should totally head over to Blue Girl Beading!! 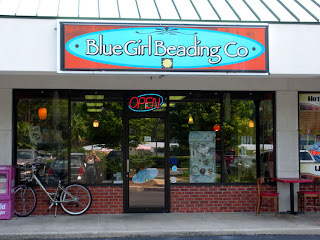 If you can't make it, please check out the Blue Girl Beading Co. Website as well as their Facebook Page. It's a real treat. Hope, I'm may just have to take a day trip to Gulf Shores and check this place out and maybe I can take a class while I'm there. 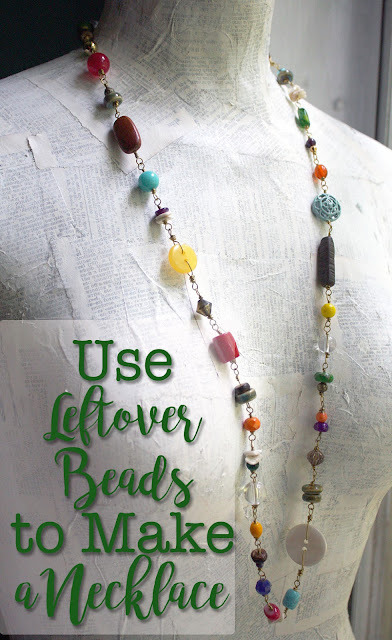 Thanks for sharing and by the way I really like your earrings the mistakes are character. 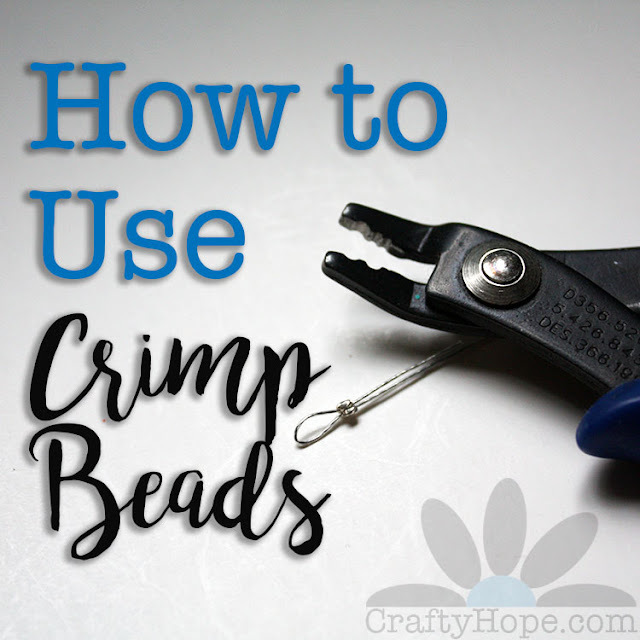 when i teach beadweaving, my favorite classes are one on one. you are SO fortunate to have had the privatre lesson :-) LOVE the earrings---they are so much fun---reminds me of tootsie pops and who doesn't like them? !